The National Student Clearinghouse is the leading provider of higher education enrollment verifications and electronic record exchanges in the United States. Founded in 1993, the nonprofit organization now handles more than 700 million verification requests and 200 million education record exchanges on behalf of thousands of institutions each year. In addition, the Clearinghouse provides thousands of high schools and districts with collegiate enrollment, progression and completion statistics. After two decades of serving the educational community, the Clearinghouse sought to meet the new and emerging needs of its participants. 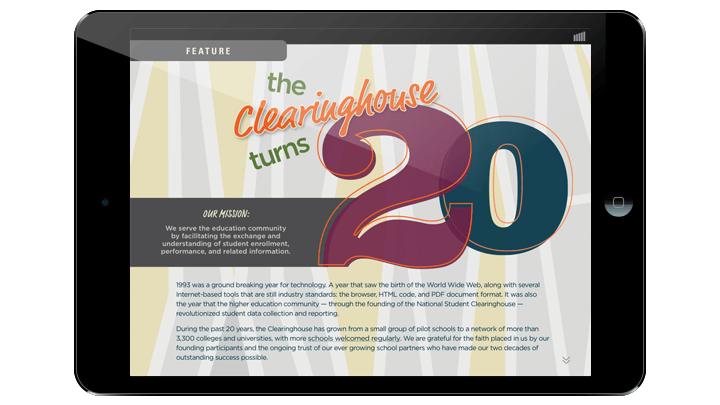 One of its popular publications is Clearinghouse Today, a bi-annual newsletter that helps readers stay current on higher education research reports and new services available to institutions and other Clearinghouse participants. 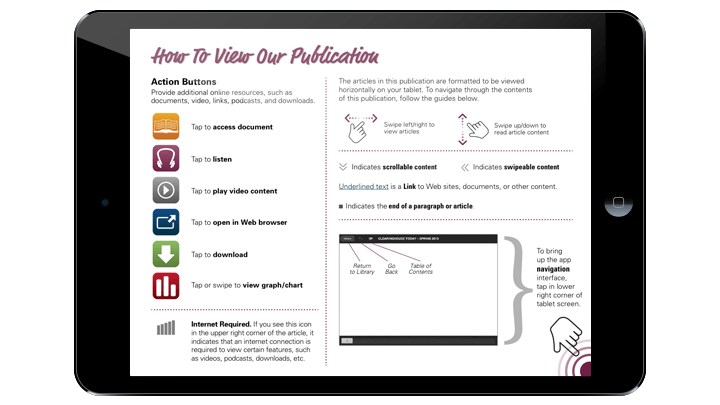 The Clearinghouse selected the Adobe Digital Publishing Suite (DPS) Professional Edition to create a rich, interactive version of Clearinghouse Today for readers to view on Apple tablet devices. 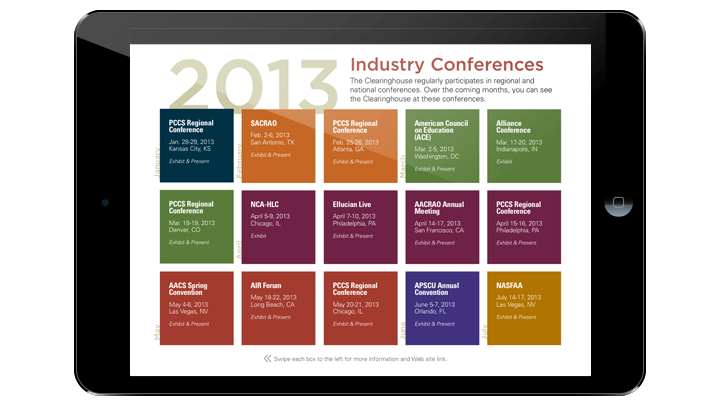 DPCI was retained to provide Adobe DPS consulting services to facilitate the launch of the premiere iPad application. To kick off the engagement, DPCI met with the Clearinghouse administrators to elicit requirements and help define how the organization could utilize Adobe InDesign and Adobe DPS to present Clearinghouse Today in a rich, interactive format. Next, DPCI provided Adobe InDesign and Digital Publishing Suite training for design staff members on the creation of interactive elements for the digital publication. DPCI also helped administrators establish necessary roles and permissions for editors, designers and technical staff members to manage assets bundled within the tablet application. The newsletter provides readers with an updated list of the newest colleges and universities to sign up for Clearinghouse services. This list includes university name, location, date of enrollment and a Department of Education ID number. To help automate production of this page, DPCI guided the Clearinghouse design staff through the setup of structured templates in InDesign for the import of XML. The structured templates allow content editors to quickly import XML data to designated fields within a page, maintain a consistent design and eliminate errors created by copy and pasting information. Throughout the creation and design process, DPCI provided the Clearinghouse content editors with extended technical support including the validation process for Apple applications, multimedia specification requirements and utilizing the Adobe Digital Publishing Suite Dashboard for publishing folios and building apps. 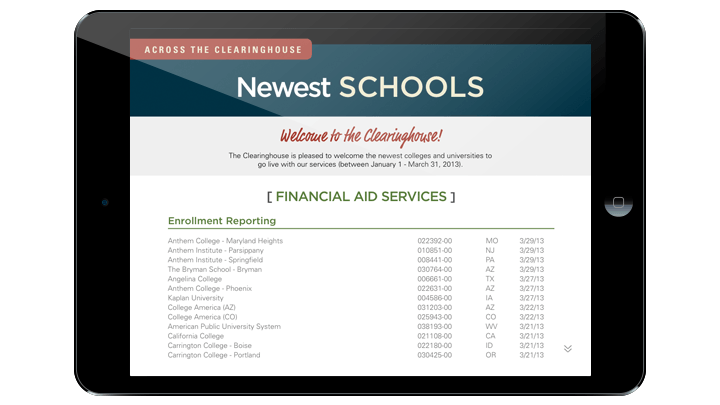 DPCI helped the National Student Clearinghouse develop a simple production workflow and a vivid iOS application that launched in April of 2013. 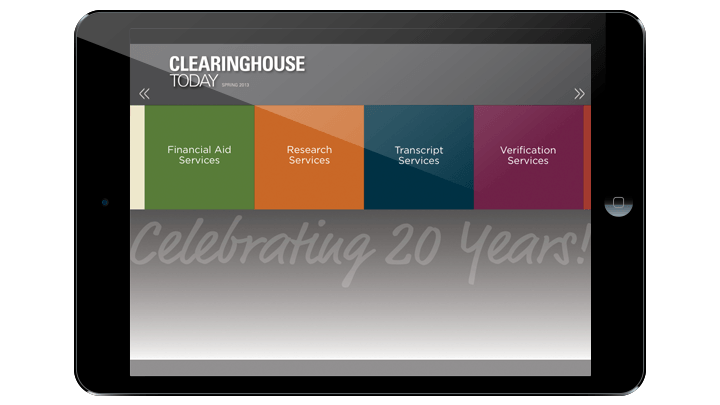 Through Clearinghouse Today, the Clearinghouse captivates a new, mobile audience of registrars, financial aid directors, and many other members of the educational community. “What a great learning experience! DPCI held our hand throughout the entire process, consulted on and researched any specific issues we had, customized the training and consultation to fit our particular needs, and were always available to us when we needed their help,"said Kim Duclos, Creative Director, the National Student Clearinghouse.